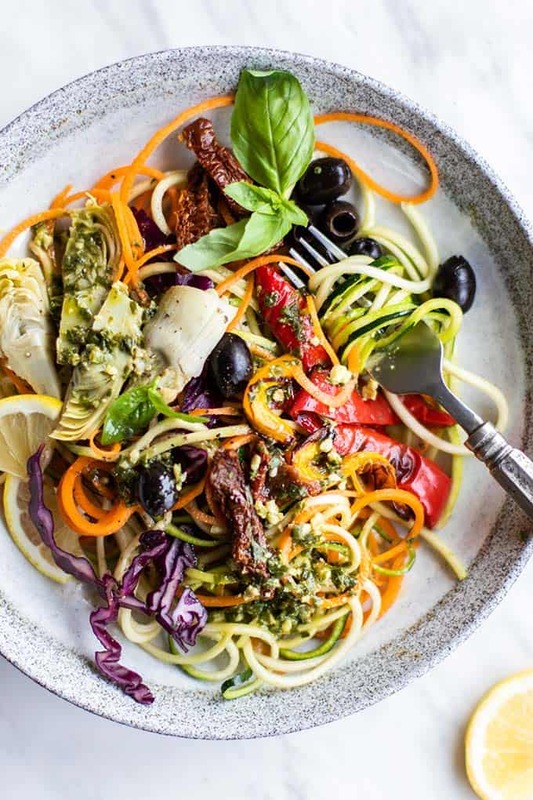 This Italian Pesto Zoodle Salad makes a perfect cooling summer meal. Topped with a 3 ingredient pesto vinaigrette, this salad comes together in 10 minutes. This recipe can easily be adapted to make warm pesto zoodles. Come summer, and my zucchini is all going in my spiralizer. For months, I’ve been eating zoodle salads for lunch nearly every day. The easiest/fastest (and best) way to make zoodles is by using a spiralizer – AKA, the best zoodle maker! I have, and highly recommend, the OXO Spiralizer. See the video below to understand just how easy and effective this method is! Use a julienne peeler. I have used this method in the past, but it takes a long time and I feel it wastes a lot of the zucchini. Try a veggie peeler for more “fettucine” type strands. I do this often, and while it’s a different texture, it makes a beautiful salad. Look at the salad in this Artichoke Millet Power Salad. I also spiralize carrots for this salad. So many veggies work well spiralized. The a zucchini is the ideal shape, but large (fat) carrots work, and so do cucumbers. I use English cucumbers because they are crisp and the least soggy. I also love to spiralize beets for salads, and even butternut squash to roast. 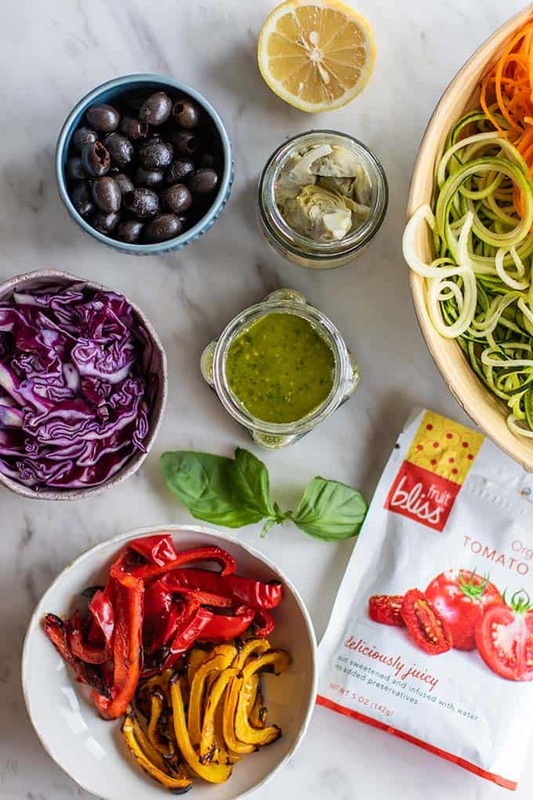 After spiralizing your zucchini and carrots, it’s time for the fun toppings! I love using pesto as a salad dressing. 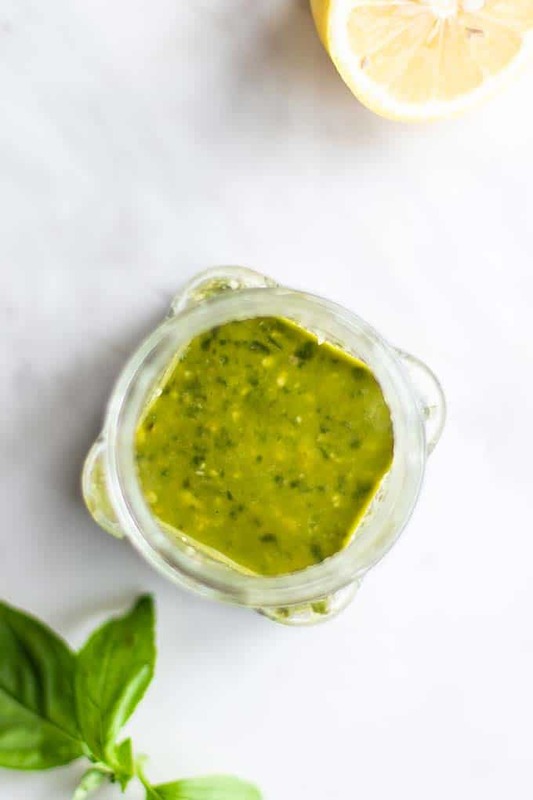 It’s very easy to do — just take your favorite pesto (homemade, or store bought), and mix it with equal parts lemon juice and white wine vinegar. Roasted red peppers make an amazing addition to this salad. If you buy them, then the zucchini and carrots are the only vegetables you’ll have to prepare. 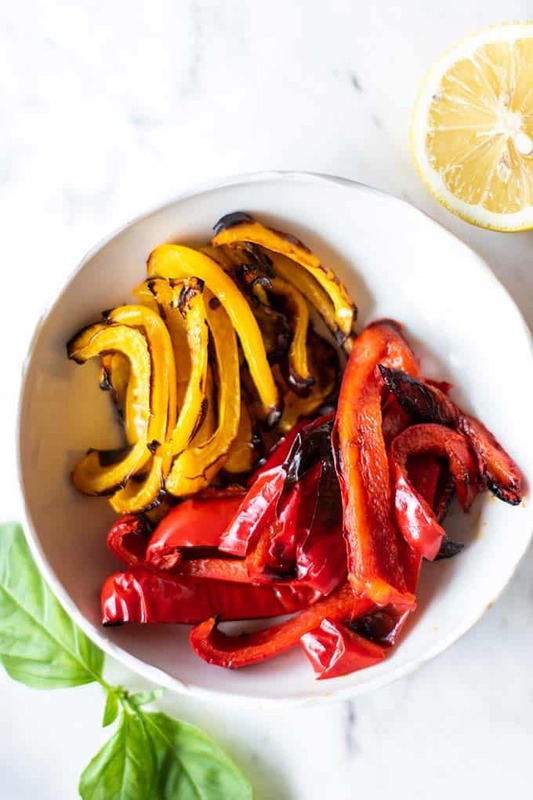 If you make my simple roasted peppers, it will take a few extra steps, but they will taste better and be a lot cheaper. If you want to avoid turning on your oven in the summer, just use raw peppers. I also tossed in marinated artichoke hearts, black olives, and sun dried tomatoes. None of those ingredients needed any preparation, so this salad is really so quick to make. 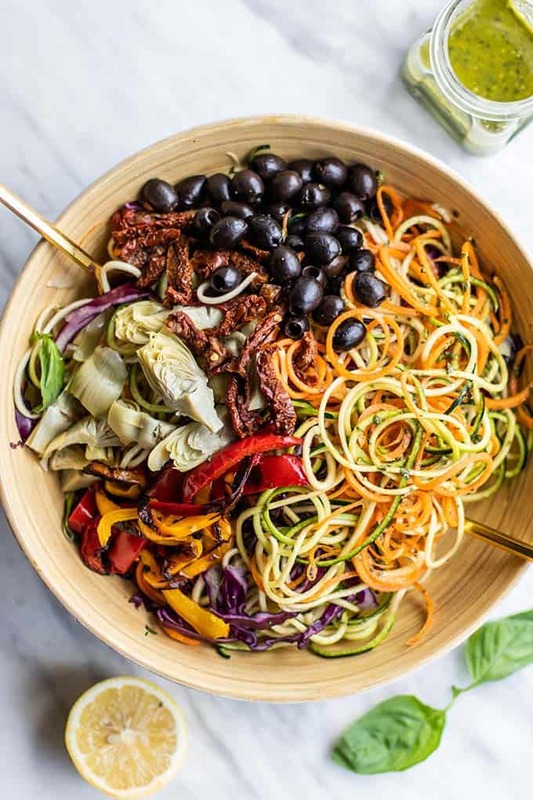 My favorite way to enjoy zoodles is raw, as in this salad. However, if you’d like pesto zoodles warm, that is also a great side dish. To transform this into a hot dish, skip the pesto vinaigrette, and just use straight pesto. Zoodles do not stay hot long after they are cooked, so it’s best to prepare them right when you’re ready to eat. 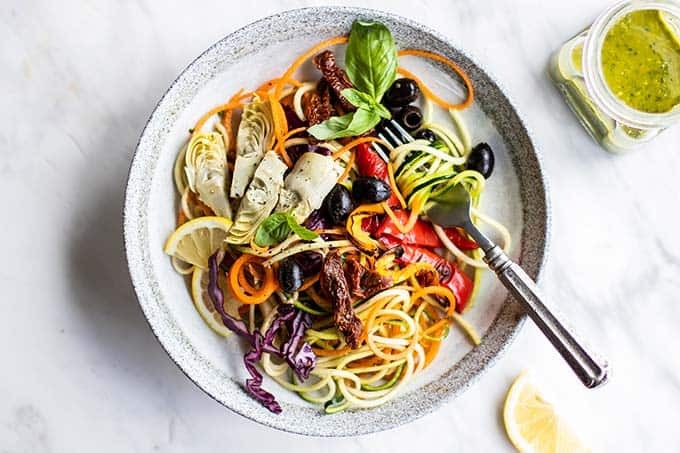 If you’d like, you can toss the artichoke hearts and olives on the roasting pan with the peppers in this dish, and when they are about ready to come out of the oven, prepare your cooked zoodles. When everything is cooked, toss in pesto and serve. Make it Vegetarian/Vegan: I used a vegan pesto in this recipe. I used this Lightened up Basil Walnut Pesto, but omitted the cheese. Make it Paleo/Whole30: This recipe is Whole30 compliant if a vegan pesto is used. Increase the Protein: This is a great side to grilled meats, but hard boiled eggs or chickapeas would also make great vegetarian options. 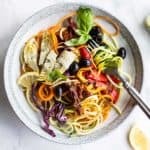 This refreshing and unique summer salad is made on a base of zoodles, and topped off with an easy 3 ingredient pesto vinaigrette. Mix up the toppings, or add protein to make it a complete meal. Prepare pesto vinaigrette by adding the ingredients to a jar and shaking, then set aside. Preheat oven to broil on high, if making roasted peppers. Slice peppers, and then add to a baking tray. Lightly spray with olive oil. Roast for 10-14 minutes, until the peppers start to char. Use a spiralizer (or other method described above) to spiralize zucchini and carrots. Add to a large salad bowl, and then add purple cabbage. Top with the rest of the salad ingredients, including the roasted peppers. Serve with the pesto vinaigrette. If making this for a meal prep option, do not add dressing until ready to serve. This salad is a great make-ahead option to have ready to go for lunch or dinner. It’s important to keep the dressing off the salad until ready to serve. Adding any salt to the zucchini noodles will draw out moisture, and you’ll end up with a watery salad. 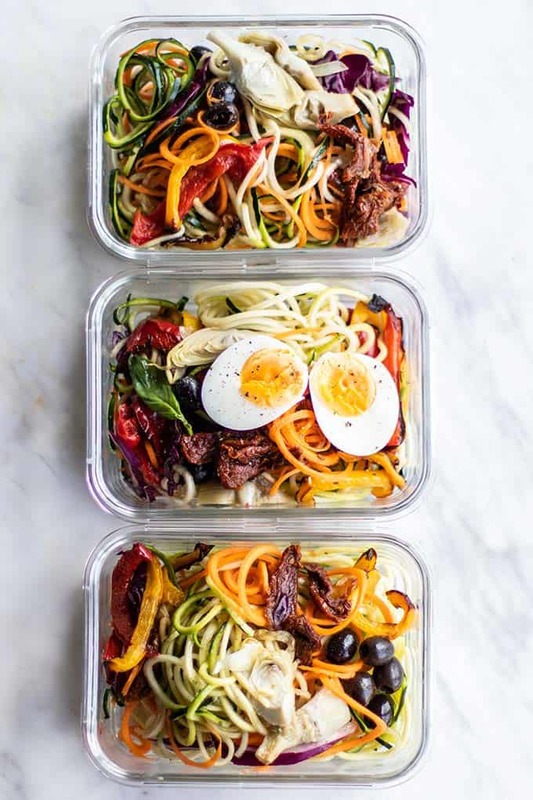 Pack the zoodles and carrot noodles first, and then add the toppings off to the side of your meal prep container. I like to top these salads with a fried or hard boiled egg. Leftover chicken or seafood would work well also. For a vegan option, try chickpeas. This is the best looking salad I've seen! I have never had zoodles before, and now I just can't wait to try! I tried the hot version for dinner last night and just finished enjoying the cold salad option now - delicious! Who knew raw zoodles were a game changer. Also, I love that it incorporated so many veggies that are different and not just the same old salad toppings. Thank you for posting this recipe - I'll definitely be making it again and again. So glad to hear that! Thanks for letting me know Anusha.